Playing a much younger Han Solo is Alden Ehrenreich, as he is trying to get off a sewer of a planet to gain his freedom, along with his childhood friend and romantic interest Qi’ra (Emilia Clarke). Once off the planet, his adventures across the galaxy begins, as he meets an older man named Tobias (Woody Harrelson), who becomes Han’s mentor. Together, they become smugglers, trying to get paid, which always doesn’t work out the way they want. In the original trilogy, you know that Han saved Chewbacca’s life and now Chewie is forever Han’s protector. We also know that Han made the Kessel Run in less than 12 parsecs, which made him famous in the smuggling world, along with meeting the suave and smooth gambler Lando Calrissian (Donald Glover), who owns the Millennium Falcon. We know all of this from the original trilogy of ‘Star Wars‘ movies, but we never get an in depth look at how all of this happened, or how Han actually got the Falcon. Well, ‘Solo: A Star Wars Story‘ is here to show you all of it. That being said, there are two more films slated to release involving the Han Solo story with Ehrenreich starring. This is just the tip of the iceberg here, which is far prior to Han and Chewie having a drink at Mos Eisley Cantina. When this movie was announced, it had Christopher Miller and Phil Lord directing the film. Those two gave us ‘The LEGO Movie‘ and the remake of ‘21 Jump Street‘. Several months into the shoot, they were fired for creative differences and the veteran filmmaker of Ron Howard (Apollo 13, Willow) was brought into make the movie. Yes, Ron Howard is a great filmmaker for sure, but most of his movies are completely forgettable. He’s just a wet-noodle of a filmmaker that while he gets the job done well, there isn’t anything memorable about any of it, visually speaking. It just feels quite bland when he’s making a movie. Unfortunately, that’s the exact case with ‘Solo: A Star Wars Story‘. There isn’t really anything that makes us jump for joy or gets us excited like we should be in a ‘Star Wars’ movie. It’s all underplayed for the most part. Even the characters are underplayed with monotone performances until the 2nd half of the long 2.5 hour run time kicks in. Sure, it’s cool to see some of the set pieces and origins come to fruition here, but none of it is ever applause worthy or even really any fun, which is a shame, because this could have been epic and magnificent. I still enjoyed most of the film. The characters are better fleshed out than any character in ‘Rogue One‘ and by the end of the film, you’ll grow to love each of these actors and young characters they are portraying. It just takes a while to get there. I know why the powers that be brought in Ron Howard to sit in the director’s chair. It was that he was reliable, easy-going, and could get a big movie out on time. It wasn’t the right choice, but the smart choice. I just wish that in telling this ‘Star Wars‘ story, which plays out a bit like a western movie that there was a little more “cowboy” in the young Han Solo as well as Ron Howard, in that I wish they took bigger and riskier chances. 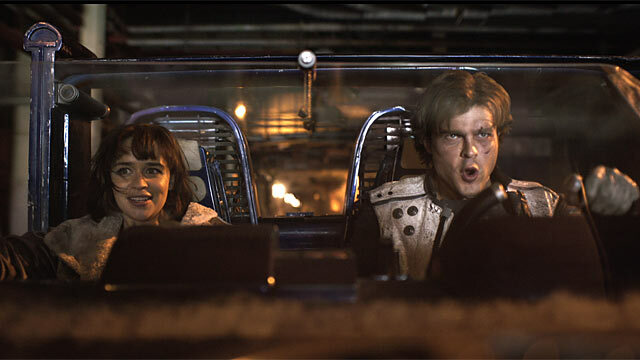 Still, with a few great cameos and a promising start to a new origin trilogy, ‘Solo: A Star Wars Story‘ is still quite good, but not the best ‘Star Wars‘ film to date. If one thing were to be the bright light in this movie, it would have to be Donald Glover as Lando Calrissian. He’s just perfect in the role and oozes Billy Dee Williams‘ charm with his own talent. I just hope we get a spinoff movie here with Lando, because there is a good story to tell there. This entry was posted on Wednesday, May 16th, 2018 at 4:54 pm	and is filed under Film, News. You can follow any responses to this entry through the RSS 2.0 feed. You can skip to the end and leave a response. Pinging is currently not allowed. « Film Review: ‘Deadpool 2’!